The Chicago Blackhawks have been without goaltender Corey Crawford for over a month, but it appears that he’s taking steps toward returning to the team. 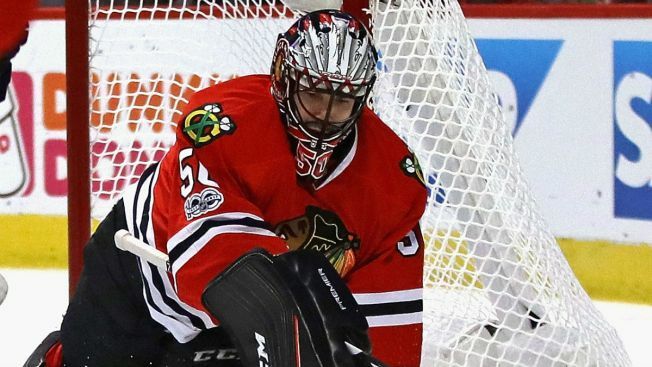 According to head coach Joel Quenneville, Crawford worked out on the ice on Saturday in Chicago. The workout was his first on-ice time since he was removed from a game against the New Jersey Devils on Dec. 23. Quenneville says that the plan is for Crawford to get in another on-ice workout on Sunday, and then to re-evaluate where he’s at in his recovery from an upper body injury that has kept him out of the lineup for the last 16 games. During that time, the Blackhawks have an 7-7-2 record with Jeff Glass and Anton Forsberg splitting the goaltending duties, and they find themselves six points out of a playoff spot in the Western Conference. The team will next we on the ice Saturday night when they take on the Calgary Flames, and will take on the Flames again at the United Center on Tuesday night.